If you've been following Inspectioneering for any amount of time, you know that we publish a lot of content. Sometimes we like to gather up some of our most popular articles and present them to our reader in a way that is easy for existing readers to digest, while making it easy for new readers to pick up. 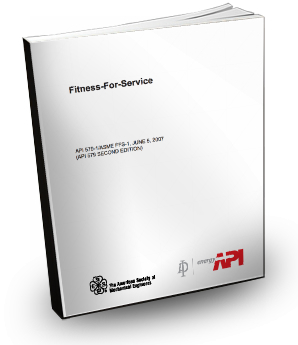 One of Inspectioneering's most popular topics is Fitness for Service (FFS). This blog post will provide you with some highlights from some of our most popular articles related to FFS. It's only a small sample of what we offer, but it should still prove useful to readers both old and new. Amanda Nurse, John Companik, and Scott Vest of BP worked together to write this article describing the FFS process as it applies to old boilers. It talks about one specific damage mechanism that can affect older boilers along with methods for detecting and treating it. This is done using a case study involving a 66-year old boiler at the BP Whiting Refinery. Power Boilers offer challenges for most facilities' Inspection and Engineering departments. BP's Whiting Refinery has five 400,000 lbs/hour steam generating boilers built in 1948 that supply the refinery's steam needs as well as 75% of its electrical demand. During recent internal inspections on these boilers, unique damage mechanisms were observed, such as stress assisted corrosion and dissolved oxygen pitting. This resulted in the use of some specialized nondestructive testing (NDT) techniques, metallurgical analysis, and finite element analysis (FEA) in order to complete fitness for service (FFS) evaluations for the boilers and allow continued safe and reliable operations. Peter Carter, Joe Frey, and Mike Guillot of Stress Engineering, Inc. wrote this article on how to evaluate FFS in damaged equipment and why doing so is so important. It describes the process using the example of damaged pipe supports. The National Board Inspection Code (NBIC) published by the National Board of Boiler and Pressure Vessel Inspectors provides standards for installation, inspection, and repair and/or alteration of boilers, pressure vessels, and pressure relief devices. In recent years, the NBIC added references to the use of FFS methods found in FFS-1. Referencing of these methods was significant because it signaled that the owner was being allowed to evaluate a damaged condition instead of automatically restoring the component to like-new condition. This option represented a significant savings to the owner at a time when deregulation was fueling competition. The trend continues and fitness-for-service evaluations for situations not currently included in FFS-1 are being conducted in the same methodical approach as FFS-1. Luciano Narcisi of GIE talks about FFS from a Risk-Based Inspection point of view. It explores the relationship between the two and how they can each apply to specific situations. It does this by using the example of a case study involving a column in a topping unit installed in 1998. If thickness is below the minimum required by design, why does the risk stay so low? If we have more than 10 years of remaining life, why is inspection recommended in 4 years? If we are measuring high corrosion rates, why does the risk stay stable? Does this mean we do not have to inspect? And so on and so forth. My intention with this article is to answer these questions and more by exploring the relation between FFS and RBI, through the review of a case study discussed herein. What are the key ingredients of a successful FFS Team? In this article by Guy St-Arneault and Hugo Julien of GCM Consultants, the authors describe the requirements for putting together a good FFS team. It lists what members are needed and the levels of experience and expertice that each one should have. It also talks about the qualifications they should be certified in along with several other important factors. Looking at the responsibilities described above, it becomes obvious that a FFS assessment cannot always be performed by one individual. FFS assessments require a group of specialists and owner/users should take great care in selecting this group of engineers. Since these engineers are responsible for most types of FFS assessments, every individual in this group must have sound theoretical knowledge mixed with solid practical experience in their respective discipline. FFS is one of the well known and important concepts in the oil & gas, chemical, petrochemical, and other process industries. It serves as a rational basis for defining flaw acceptance limits, and allows us to distinguish between benign and dangerous flaws. Understanding it is an essential to nearly every process and piece of equipment in the industry. If you're interested in learning more about FFS, there are plenty more articles linked at our FFS topic page.